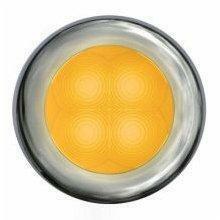 Hellamarine 3" round LED UV resistant courtesy lamps can be installed almost anywhere onboard. Advanced lens technology provides a cool, even spread of soft light while consuming less than .5W, a fraction of the energy of traditional bulbs. Each lamp is completely sealed, highly shock, impact and vibration resistant and run extremely cool for safer installations where the heat of an incandescent lamp may cause damage. Flush mount installations require a 2" cutout. 12/24V DC. Flush mount.